In October 2012 we published an extensive story about Nokia’s development and abandoning of the mobile MeeGo operating system. For the story we interviewed dozens of current and ex Nokia employees who worked on the project. The story rose quickly to be the no. 1 most read article in the almost 14-year-old history of Muropaketti. The English version of the article has been read over 90,000 times and it was featured in the media all over the world, including Engadget, The Wall Street Journal, CNET, The Register and Slashdot. Since publishing the original story, we’ve received dozens of e-mails from people who worked on MeeGo. Most just wanted to thank for the article, but many also wanted to tell their part of the story or just give more details on some parts of the article. For this short summary I’ve gathered some of the new stories I’ve received after the first article that I think add more value into it. As with the original article, I’ve tried to concentrate on the hard evidence and facts given to us, and tried to avoid the opinions and interpretations of the writers who shared their stories with us. We’ve tried our best to verify and compare the information given to us, and merged them with information leaked to the public over the years. The reader should know that the people interviewed worked on projects that were abandoned after years of work. You can send feedback about the original article and this summary by e-mail to sampsa.kurri [a] https://muropaketti.com. The English translation of the article was made by to Aleksi Vänttinen. N9, the only MeeGo phone released to the public by Nokia doesn’t have support for CDMA networks, which are used in the USA by Verizon and Sprint. While Intel was developing its own mobile processor and drafting support for the CDMA and LTE technologies, Qualcomm was interested in working with Nokia. Cooperation with as many chip manufacturers as possible (Texas Instruments, ST-Ericsson and Qualcomm) was positive for Nokia, as it would be able to negotiate better prices with its large buying quantities. A common project with Qualcomm was found when development of an N9 variant with CDMA support (model RM-716) for the American market, more specifically Verizon, was started. Code named ”Searay”, the N9 variant had a Qualcomm Snapdragon SoC with CDMA support. Hardware adaptation (meaning the lowest layer of software combining the hardware with the operating system) was already being implemented when the plans changed completely in February 2011. As Nokia declared its new strategy to switch to the Windows Phone operating system, the plans for the Searay N9 were also changed accordingly. The Windows Phone platform supports the same Qualcomm Snapdragon SoC the Searay N9 was being developed for, so in the spring the project was changed on the fly to become Nokia’s first Windows Phone smartphone, the Lumia 800. This is why Nokia’s CEO Stephen Elop was able to display a working Windows Phone variant of the N9 to his employees only a few days after the N9 was launched in June 2011. Unfortunately we haven’t gotten a lot more information about Nokia’s and Intel’s cooperation or the code name ”Soiro” device based on the Ilmatar platform. We have heard though, that one of the biggest challenges with developing the Intel platform was its high power consumption. The real time graphical development tools, on the other hand, have been praised. Closest to releasing an x86-based Intel-MeeGo phone got LG, which displayed a prototype of the GW990 already in 2010 at the CES event in Las Vegas. The GW990 featured Intel’s 45nm Moorestown SoC, 512 MB of RAM, a 4.8 inch 1024×480 resolution screen and Intel’s Moblin 2.1 operating system, which Intel had developed before MeeGo. LG was going to update the OS to MeeGo, but ended up abandoning the phone as a mere concept later in the spring of 2010. In the original article we talked about the MeeGo tablet code named Senna, which was based on ST-Ericsson’s NovaThor U8500 platform and looked like a big N9. It was the furthest developed tablet device Nokia had and was even shown to the new CEO before MeeGo was abandoned. Nokia also had two other tablets in very early stages of design or at least as a concept on paper, but technical details of these devices are very limited. The other was very much like Senna, but the concept of the second device was technically very interesting. The concept was code named Cerberus and it consisted of three connected displays. The device could be folded down like a map and as such would’ve been the size of a regular mobile device with a screen on top for basic functions. When folded open, the device could’ve been used for reading books, browsing maps and playing games. Although the idea was regarded interesting and content for it was being planned, the device was finally deemed not interesting from an app development point of view. Qualcomm has patented a similar device like the one described above in 2009 (Multi-fold mobile device with configurable interface). It is a foldable device comprised of three pieces. Nokia and Qualcomm were working together with the N9 for the American market at the time of the patent. Tablets weren’t regarded as especially important in Nokia’s MeeGo development and as such, Senna was the only device to advance to prototyping level. The other two devices were abandoned in their early stages. According to a few of the people who contacted us, for a short period of time at the end of 2010 Nokia was planning for a device utilizing E Ink (electrophoretic ink). One of the people who worked on the project told at least one model would’ve had two screens, one of which was a regular LCD panel and the other an E-Ink panel capable of a 15 FPS frame rate. The E Ink project was eventually quickly scrapped. The decisions at Nokia in 2011 regarding MeeGo’s fate were eventually made in a very small group of people. Electronics giant LG was very interested in MeeGo right from the beginning. When MeeGo’s continuation was being considered, LG was considered too small in the smartphone business to have effect on the decision. Samsung was also mulling over its possibility to hop on the MeeGo train with Nokia. 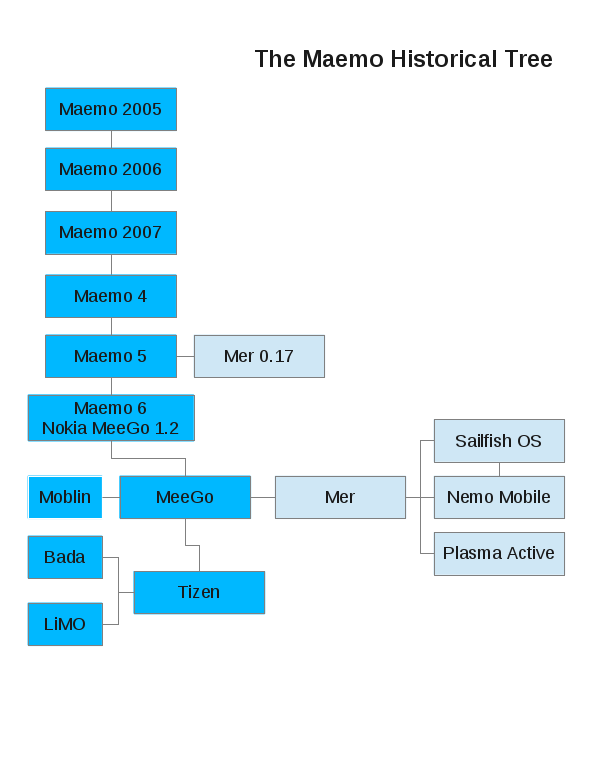 At the time Samsung was a partner in developing the LiMo OS (Linux Mobile), today Tizen, of which Samsung would have given up if moving to MeeGo. According to an ex Nokia employee who was part of the negotiations, Samsung wasn’t even given a chance to give their final answer before Nokia already made its decision to move to the Windows Phone operating system. Even if device manufacturers had chosen MeeGo, many thought the biggest opposition would’ve been the mobile service providers. In the original article we handled MeeGo’s weaknesses with LTE and the challenges of building a new ecosystem next to Apple and Google. Confusing events surrounding the MeeGo OS and interface caused headaches also for those responsible for Nokia’s Ovi Store app store. At Ovi Store they made sure that when a new device hit the market, there already were new apps and content available for it at the Ovi Store. As the plans kept constantly changing, decisions had to be made and developers had to be instructed on information based almost alone on guesses. With MeeGo devices target groups and key features kept changing during the development almost without a warning. Content design for the devices was started with basic knowledge, but in the next meeting the target group or the key features could’ve been changed to something else. There was no information for app developers about what kinds of apps were needed or how they would be developed for the coming MeeGo devices. Software development tools were being developed side by side with the operating system itself. The only thing that was known was that there’d not be a lot of content available when the device would be launched. During the MeeGo development pressure around the ecosystem was huge and instead of the quality of the apps the only thing that seemed to matter was the amount of them when competing against Apple and Google. In the original article we talked about difficulties encountered inside Nokia by the Symbian and MeeGo teams while working in the same organization. A person who worked with the Symbian user interface told that MeeGo caused several delays with Symbian development. There were multiple cases of conflicting communication on whether the Symbian and MeeGo UIs would be combined or not. Communication between the development teams didn’t work and meetings between the teams were often canceled. A Symbian team member told as an example, that despite the lack of communication they tried to find out what was going on in the MeeGo UI development by looking for information and leaks on news sites such as TechCrunch. A top secret operating system was being developed at Nokia side by side with MeeGo in 2010-2012, code named Meltemi. Nokia never officially told about the project. It was an operating system targeted for more affordable smart phones and was never given a final name, but MeeGo Lite was a strong candidate. Meltemi was meant to be 100% compatible with MeeGo and it would’ve ridden on MeeGo’s developer ecosystem and apps. The objective was to get the operating system to run at a constant 60 FPS and to get apps to launch in one second. One of Meltemi’s main features was data control in a database, which would enable a single call to the database to fetch a lot of information. There were massive difficulties with the development of Meltemi, such as tight schedules, firmware versions, the database and functionality of its features, new SoC and so on. The project was finally scrapped on June 14th 2012, and Mary McDowell, the person responsible for the project, had to resign. There’ve been a lot of rumors on the Internet about Meltemi being almost finished. According to what we’ve gathered, Meltemi was far from being finished but we’ll have more on that in our next article, ”Nokia Meltemi’s story” later in 2013. Noniin, viimein sain vastauksen siihen miksi lumia 800 tosiaan käytti samaa muotoilua kuin N9; vastaus olikin sitten niinkin yksinkertainen että sen piti olla N9 variantti..
Tabletti näytti myös jännältä, harmi kun ei prototyypiksi edennyt niin olisi nähnyt miten tuo toteutetaan käytännössä. Ps. aikooko joku kääntää tämänkin englanniksi ulkomaalaisia tekniikkasivustoja varten? Melkosta sekasotkua on ollut tuo touhu Nokialla ennen WP:tä. Asiasta sen enempää ymmärtämättä päätös siirtyä siihen oli ihan oikea, tosin sitä ei voi tietää mitä Androidin kanssa olisi jo saavutettu. Nokia alkaa kuitenkin tällä toimintojensa siistimisellä osoittamaan heräämisen merkkejä ja Lumia 920 onkin kokonaisuutena paras Nokialainen viiteen vuoteen. Androidiin ei Nokian olisi kannattanut siirtyä koska sillä on jo tarpeeksi säätäjiä olemassa. Melkoisia synnintunnustuksia Elopille. Ei ole kaveri turhan hyvässä tilanteessa tullut Nokiaa luotsaamaan. @1 lähetin juuri tekstin käännöksen Sampsalle. Edit: Siis 1. kommentoija TaskuMuron puolella. Vähän hassu tämä uusi kommenttisysteemi, joka heittää kommentin kirjoittamisen jälkeen foorumeille. Toki parempi kuin vanha, jossa kommentteja ei voinut poistaa/muokata. Huhhuh mikä soppa nokialla on ollut/on meneillään.. Kiitokset Sampalle jälleen upeasta ja kiinnostavasta artikkelista! Vahvistaa entisestään käsitystäni Nokian tilanteesta ennen WP-aikaa. Tekemisen into, työntekijöiden kuuleminen, toiminnan joustavuus/luovuus yms. tuhottiin kankealla koneistolla, eikä työntekijät enää kokeneet työtänsä mielekkääksi. Radiossa haastateltiin Nokian entistä ympäristöasioiden johtajaa, joka kertoi eronsa syyksi sen, että 3G-tukiasemaa 1990-luvulla kehitettäessä vallinnut tekemisen into ja halu kokeilla uutta katosi. Sen jälkeen kehitettyjen juttujen luonnissa ollut into ja halu tehdä uutta lopahti, sillä jokaiseen asiaan piti pyytää johtajilta ja ylemmiltä tahoilta lupa eikä työntekijää enää kuunneltu. Lopputuloksena oli se, että kukaan ei tiennyt, kuka laivaa ohjasi tai antoi komentoja. Sitä kuvastaa juuri tuo Symbian -tiimin epätoivoisuus ja tiedoituksen puute. Joo-o, aika surkuhupaisan kuvan tuo Nokian silloisesta johtamisesta antaa. Yhä edelleenkin kyllä harmittaa, kun potentiaalia oli vaikka mihin. MeeGo olisi varmasti huipputuote jos sitä olisi kehitetty koko Nokian nykyään irtisanotun organisaation voimin tähän päivään saakka. Tosin muutoksen johtamisessa ja organisaatiossa olisi kyllä pitänyt aloittaa jo vuosia ennen kuin Elop astui ruoriin. Hardispuolellahan selkeästi ovat vielä huipulla. Ottaisin mielelläni 920:n tai 808:n jos ne saisi MeeGolla!